A common theme that has been running through some of my recent public transportation-related posts (not nearly as frequent as I would wish, my apologies) has been about the vast amount of urban real estate committed to accommodating personal vehicles. As I’ve written before, Vancouver is still one of the better North American cities when it comes to urban density through a greater focus on public transit and less so on freeways and parking. But one thing that’s always bothered me with vehicles on North American roads has been the relatively narrow choices in size, especially when you see the wide range of options in Asia. Think of all the urban space that could be saved if our roads and parking spots weren’t designed to accommodate a minimum four passenger vehicle standard (I’m assuming). The experimental i-Road personal car by Toyota pictured above is an example of something more suited size-wise for transporting single-car commuters that dominate the roads, especially during rush hours, but questionable whether it would catch on in North American markets. Still, it’s more practical than a motorcycle and sounds like it rides a bit like one as well (leans around corners). Read more about it in the Japan Times article here. Of course, it would take much more than having a few of these vehicles on the road before they can have an effect on our cities, but the impact of the increasing popularity of green vehicles like Smart Cars, as well as motorcycles, is being seen with special size and electricity plug-in parking accommodations. 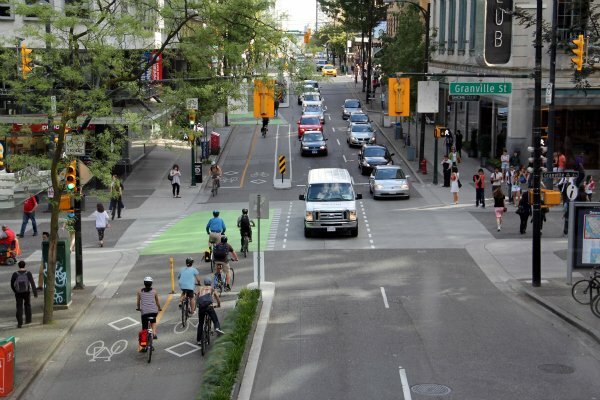 Better yet, dedicated bicycle lanes are demonstrating the possibilities in freeing up urban space if and when both cities and people become more open to accepting more right-sized transportation options.